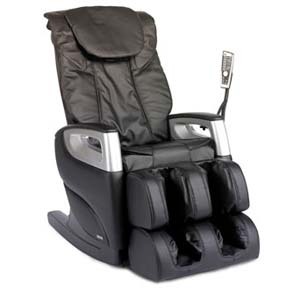 You’ll be in good hands with this full–featured massage recliner. Massage options include Swedish, Shiatsu, kneading, tapping, rolling, and dual–action. The S–shape backrest rail conforms to your body shape to provide optimum support and comfort. For your calves and feet there is a Total Body massage with an invigorating air pressure system. Choose from three pre–programmed massages with customizable strength, speed and intensity. You can manual adjust the rollers for kneading and tapping. There is an automatic angle adjustment for back and footrest to ensure a perfect fit. The chair automatically shuts off after 15 minutes in case you are called away. A convenient, easy–to–use LED remote puts the control of all these features in the palm of your hand. Massage Actions – Swedish Massage, Shiatsu massage, kneading, tapping, rolling and dual–action. S–Shaped Backrest – Backrest rails conforms to body shape for optimum support and comfort. Air Pressure System – Invigorating air pressure system in seat, calves and feet areas. Roller Adjustments – Rollers can be manually adjusted for kneading and tapping actions. Dimensions: H. 45" W. 27.5" D. 53.5"
SALES TAX is INCLUDED on NEW Berkline Massage Chair Orders. 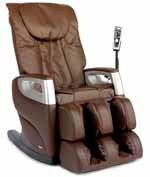 *Warranty Information - COZZIA products have the following warranty: COZZIA’s massage chairs, massaging motion upholstery and home theater massage seating provide a one year in-home service warranty and a two-year parts warranty. Warranties are only valid in the 48 contiguous United States and Canada and are contingent upon the consumer operating the chair according to the corresponding instruction manual.